Shimla : Himachal Pradesh Chief Minister, Virbhadra Singh said the state government would take the advantage of expertise of New Zealand in developing various sectors like horticulture, agriculture and dairy etc. 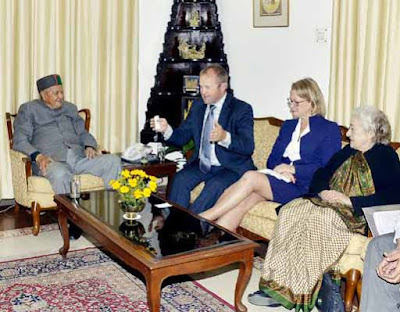 He said the New Zealand government had shown its keenness in supporting Himachal Pradesh for horticulture development project, to be funded by the World Bank. The Chief Minister was presiding over a meeting with the delegation of Pipfruit, New Zealand, here today to discuss the progress on the project to support the growth of productivity for apple growers. He said New Zealand was one of the highest apples producing country where per hectare apple production was 57 tonnes. The State would be benefited with their knowledge in increasing fruits production, especially apple and stone fruits. He said agriculture and horticulture sectors were main mainstay of rural economy of the state and the government was giving added priority to develop these key sectors. The state had taken advancement in agriculture, horticulture, organic fertilizers, pesticide management and introducing new varieties of apple. He said apple contributes to 90 percent out of total fruit production in the state and the state government was interested in introducing more new varieties of apple to benefit the apple producers. Virbhadra Singh said the emphasis of the government would on diversification of stone fruits and rejuvenation of old apple orchards in which the knowledge of New Zealand would play an important role. He said the Memorandum of Understanding (MoU) would be signed with the New Zealand government for implementation of the project early in the next year. Vice Chancellor, Horticulture University, Nauni, Vijay Thakur informed that 28 types of fruits were being produced in the state and ten more fruits would be introduced in the coming years as the state had suitable climate for growing most of the fruits. The efforts would be made to enhance the fruit production which would further help in strengthening the economy of the State. Mike Petersan, Special Agricultural Envoy, said the New Zealand government was looking for partnership with Himachal Pradesh through trade agreements and negotiations. He said New Zealand had good research institutes and help would be extended to the State apple rejuvenation project. He also expressed the willingness of New Zealand government to partner with Himachal Pradesh in education sector as well. He also invited the Chief Minister, Horticulture Minister and officers of the state government to New Zealand and added that a meeting would be organized there with the progressive farmers.